Starting with your first Kung Fu class you will begin improving your physical health and fitness. Through stretching, warm-ups, forms, striking and self-defense techniques you will work muscles in a new way. With repetitive movements and practice, muscles will become stronger, coordination will improve, and reflexes will hasten. Once past the beginner level, sparring practice and weapons training will utilize your improved skills and strengthen them even further. When you increase your muscle mass and your activity level, weight loss is a natural progression. With a class full of supportive, like-minded individuals, you will feel encouraged to make healthy decisions outside of class too. Kung is a fun way to strengthen your body and lose weight while focused on improving skills and meeting goals in martial arts class. We can’t take away your life’s stressors! But, we can help you manage how you perceive and react to them. Unmanaged stress wreaks havoc on your physical and mental health. It can lead to high blood pressure, heart attacks, anxiety, depression and more. 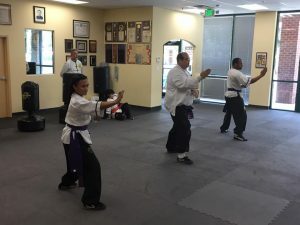 By joining a martial arts class, you enjoy the stress-reducing benefits of a physical workout, of connecting with other people, of having fun, and reaching goals you set for yourself in class – all lowering the impact stress has on you. The breathing and focus required in every class will help you control your reaction when stress arises, so you can be productive and continue to move forward. The philosophies of Tien Shen Pai will alter your perspective so that previous stressors are put in check as you begin to focus on things in life that matter most. Perseverance is a character trait all adults can use, but not everyone comes into naturally. Successful martial arts practice requires you to let go of preconceived notions of what you can and can’t do and keep trying and working towards your physical and mental goals. During your Marriottsville martial arts classes you are sure to feel frustration, anxiety, and self-doubt at some point, but your ability to stay disciplined and keep going is what will grow your character and improve your mental strength and health long-term, inside and outside of class. Everyone enjoys a mental boost when they reach a seemingly unattainable goal with hard work & discipline. Personal security is something many people don’t feel strongly about. Could you protect yourself if someone tried to harm you? In martial arts class you will learn and perfect a series of precise attacks and blocks, allowing you to have the strength, skills, and self-confidence to protect yourself should the need ever arise. Virtue, Wisdom, Humility, Martial Arts. Self-improvement is as much internal as it is external. With a focus on following the ideas of Tien Shan Pai in your self-behavior and everyday lifestyle, you can achieve a better balance. As part of the class, we will teach you the tenants of virtue, wisdom, humility and martial arts through experience and lessons. If you’re interested in trying martial arts, give us a call today. We are offering two FREE semi-private lessons so you can give martial arts a try before you commit. We look forward to hearing from you.